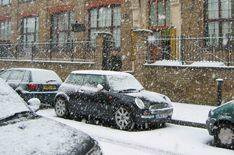 Drivers warned of wintry weather ahead | What Car? Wintry weather could soon cause chaos on the roads as millions return to work after the festive break. Temperatures across Britain are already much lower than over the holiday period with snow expected across much of the UK tomorrow (Thursday). Met Office head of forecasting, Brian Golding said: 'After a mild Christmas and New Year, we will notice a real change to some cold and wintry weather. Drivers, especially those driving long distances or in remote areas, are advised to prepare themselves for the bad weather by keeping essentials like food, water and warm clothing in their car. In addition, motorists are being advised to keep a torch and a spade in the boot, and make sure their mobile is fully charged before leaving home.